Arts & Culture | Buddhist art: images of detachment? Buddhist art: images of detachment? London, UK -- A new gallery devoted to Buddhist sculpture which opens today at the Victoria and Albert Museum, provokes interesting questions about the relationship between art and religious devotion. How has a religion –or is it a philosophy? - which teaches the need for detachment from all worldly matters produced such a substantial volume of artistic work preoccupied with material form, frequently made from precious materials? The gallery includes sculpture from across the Asian continent, dating from between the 2nd and 19th centuries which explore the life of Buddha and the development of Buddhist doctrines. 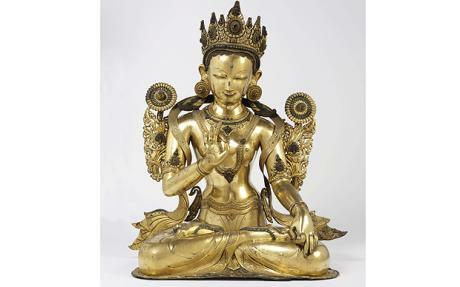 While many pieces, in their simplicity of form and material, clearly intend to inspire a state of peace and compassion in the viewer, they sit alongside others which are highly ornate and lavish, such as the gilt Bronze Padmapani statue from Nepal decorated with precious stones. Means radically diverge from ends, or so it seems. This surprising sense of outward contradiction owes much to the misappropriation of Buddhist philosophy and its iconography in Western culture, an interpretation which often accuses Buddhism of promoting ‘selfish’ detachment and a mental practice only, rather than a feeling one. Many of the pieces included demonstrate Buddhism’s incorporation of both. The most sumptuous devotional figures on display, suggests the galley’s curator, John Clarke, are intended to provoke an emotional response just as strongly as they inspire a ‘practice’ of mental being. In particular, he highlights images of the Bodhisattva, figures committed to but yet to achieve final Buddhahood, which would have been supplicated with prayers, perhaps not as idols, but as idealised figures of compassion. The need for a greater understanding of Buddhism, possibly the most cherry-picked religion in the West, is one of the motivating forces behind the new collection. The £1.5 million gallery has been made possible by a donation from the Robert H.N. Ho Foundation, a Hong Kong philanthropic organistion committed to the spreading of Buddhist thought. Ho, the foundation’s director, has been open about his intentions, hoping that the gallery will generate interest in the religion and inspire people to take up meditation. This is art with an unabashed interest in promoting a wider social and philosophical value system. However, John Clarke is unequivocal, insisting that the V&A is not concerned with promoting a religious doctrine: “We’re a museum, not a temple. We haven’t been directed by the Ho Foundation in putting the gallery together. That said, we have to explain Buddhism for people to appreciate its art, which inevitably means promoting a wider religious understanding”. The gallery, along with the first Buddhist arts festival to take palce in London, The Many Faces of Buddhism, which will include the screening of films examining the work of artists like Leonard Cohen and Martin Scorsese, will hopefully go some way to providing greater understanding of the full diversity of Buddhist philosophy and its complex appropriation within Western culture.